Upon long ago paths of pain? Knowing the outcome would be the same? You still felt you had to explain? Grateful, at last, to be free. 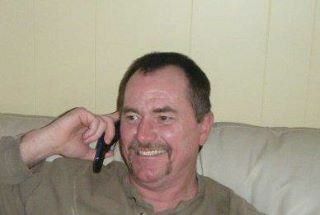 Nicholasville, Jessamine County and the whole world lost an incredible person on Thursday, October 6, 2011. He was more than just incredible. He was a friend. My friend. Friend to strangers. Friend to passersby. Friend to people he didn’t even know yet….but planned to get to know. When I met David Burton, my newly-paid off Chevy had just blown a water-pump. I had gone to the office of my long-time friend, Kevin Corman, and asked him to recommend me someone honest and reasonable. He wasn’t there, but another great friend, Allen “Doodle” Peel, was. He called the service station and talked to David, who told him to send me right over. The water pump lasted just long enough to get me to the service station. The fellow who came out was David. This wonderful, larger-than-life, good old boy, who reminded me of a cowboy, immediately put me at ease. He checked out the car and gave me a very fair price to fix it. He even took me to my bank so that I could get the money. He drove me to my home in Nicholasville, and came back to pick me up when the repair was done. I was amazed by his willingness to go the extra mile for me. In his truck, during the time he transported me where I needed to go, we talked about a lot of things. We talked about faith, and my plans to move to Texas and eventually establish a ministry at the border. We talked about his plans to run for magistrate in a few years. We talked about his girlfriend, and how much he cared about her. We talked about his mom, and about a funny story when David said, after warning her a few times about complaining about his driving, he put her out on the side of the road to walk home. It was less than a block, and I had to laugh out loud….especially when he told me her response to this ‘tough love approach.’ She didn’t cook for him for a while. A long while. I think both learned their lesson. David was this fellow that I never saw without a smile. If my car needed anything, I went to him. New headlights, whatever, they could fix it. His brother was as funny as David in his way, and I loved to listen to them banter back and forth while they were working. When God worked a miracle in my life and gave me a working and wonderful car after my Chevy was no longer worth fixing, it was the Burton family who came up with a solution for fixing the muffler on the new vehicle. I probably would have gotten a ticket if it hadn’t been fixed, and didn’t have the money. David and his father put their heads together and told me that in exchange for my old car and some cash they’d paid me, they would put a new muffler on–for free. That day, he leaned into my new car and turned on the engine. I’d forgotten to turn off the radio, and a blast of music from K-Love came out. David didn’t flinch. He backed up and turned and grinned at me. “You be jammin, haven’t ya?” And, we laughed. Something I found myself doing often and heartily anytime I was around David, and his brother at the service station. He could find humor in anything, and help even the most grouchy soul find the humor too. David was the one who put the muffler on that day. We joked around as he did it, and I fussed at him for not protecting himself from the flames of the welding device he was using. He reminded me how long he’d done the job of welding, fixing cars that didn’t wanna be fixed, and just generally being the top notch mechanic that I (and most of Jessamine county) knew him to be. Case closed. That day, probably the last day we talked at length, we talked about his efforts to find an affordable car for his girlfriend’s daughter, and discussed friendships we had in common, and laughed so much. After that, in August, he brought his girlfriend in to meet me at work at Brannon Crossing. I liked her immediately, and noted how happy they were together. He was still looking for a car for her daughter, and we talked about some options for him to look at. The last time I saw him, I was driving by the station, and blew my horn. He threw up his hand and hollered a greeting at me. That made me smile. Anything from David pretty much always made me smile. He was good at doing that for everyone. David had a massive stroke on Wednesday, October 5th. He died on Thursday. I didn’t know. I was up in Ohio on my first mission trip. But it is interesting that the day he passed, I was getting my car fixed up in Ohio. As I waited for it to be repaired, I thought of David, and the time I was at the service station to get my headlights fixed. He’d told me, when he heard that I’d transferred jobs, that he and his girlfriend would be in to see me at Newtown Pike. And I know that would have happened. David was a man of his word, even the casual words. He just ran out of time. Last night, I was sitting in the office of our minister of music discussing a solo I wanted to do. The conversation went to other things, and he and another church member started discussing David’s death. At first I wasn’t sure who they were talking about, and then, I realized. I stopped them and said “Not David?” They, not knowing him well, and not really knowing who my friends were, didn’t realise they’d been talking about someone who had become, in just over a year, a good friend. I excused myself to go to the visitation. When I got to the funeral home, it was crowded. Outside, people were standing, talking, grieving. Inside, it was the same. One thing that struck me was the amazing diversity of the people gathered. People from all walks of life. People that might not have even known each other or socialized together. But the common denominator was that David knew THEM. He was that person who effortlessly crossed social lines and could befriend anyone….and did. But of course, that didn’t happen. My friend, a smile on his face, rested there silently. I had already paid my respects to his father, known in the community as “Poochie” and I didn’t see others that I really knew. So, after praying for him, I quickly left. The tears I brought with me into the funeral home left with me as well. Today, I’m still stunned. I still half expect to drive by the station and see him in his work clothes, joking around, swinging a hand up in a hearty hello. David, you were so much to our community. You didn’t put on airs, and you never talked down to anyone. You liked everyone as far as I saw, and you made a scared woman relax and laugh when her water pump blew up on the highway. I’m glad that Doodle Peel sent me your way that day. I got more than a working water pump. I made a lasting friend. Rest in peace, David. You made an impact on me. I think you did on everyone, everywhere you went. I have no doubt even now, you are with the Lord, cracking him up with one of your jokes or comments. Rest in peace. We will miss you….until we see you again.